Wear precious rings without the worry of them slipping off your finger and losing them forever with our ring adjusters. No need to pay a jeweler for a size adjustment. 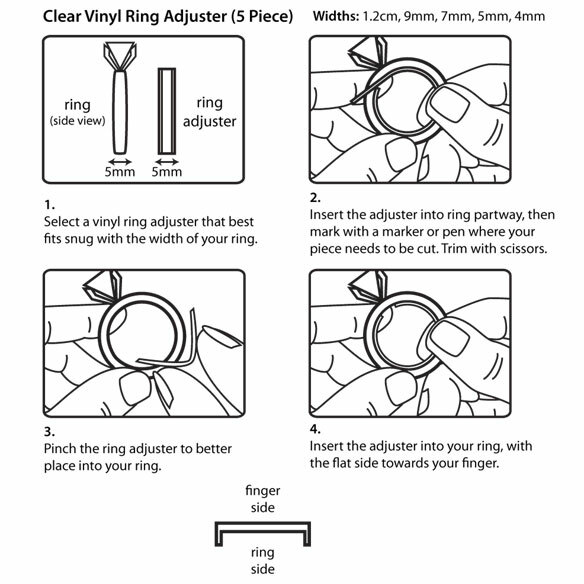 With this ring band adjuster, you can "do it yourself" right at home! Simply insert clear vinyl ring snuggies inside your ring. A ring adjustment band is perfect for expensive styles and costume jewelry. Set of 5 bands snips to ring size for a custom fit. Ring size adjuster bands vary in width from 1/8" to 3/8". They make too large rings fit. Bought this for my son when his wedding band fell off into a grocery bag he had unpacked and thrown away. Once he realized his ring was missing we looked all over and remembered he unpacked the groceries. There it was in the bag, in the garbage. We were lucky to find it that time and didn't want to take any more chances. He was ready to put the ring away so he wouldn't lose it when I saw this ring size adjuster. He didn't want to see, or feel the guard. This works great. He can't see it or feel it under the ring, and it stays in place. He can't believe how well it works. I used this ring adjuster one other time with great results, but needed to replace it, and tried another style. That one was a complete flop, so I went back to this tried and true design. Love these for wider rings! Order these and smaller metal adjusters but can't get those to work well. Love the clear wider ones. Gotta get more!! i like it help adjusters for my ring so it could fit right. This is the first thing I have found that actually holds my rings in place without breaking and they are comfortable too. I have used this product for many years and find that it fits more rings and stays in place. the ring guards are very comfortable - and invisible - and durable - and flexible. they fit any ring width to adjust to any size just by lengthening or shortening the ring guard. I love them. This is perfect! It stays in place, can barely be seen, and I can't even feel that its there! I also have a friend who has bought these and she loves them too! My ring now stays in place! YAY! Note: I did not measure the plastic sizer according to my finger (as instructed), I measured it according to inside of ring band. With careful trimming a little at a time, I managed a perfect fit! I plan to order more! Exactly what I have been searching for!!! I have tried other ring sizer but none of them worked. However, the ring band adjusters work great. Only place I can get these. This adjusted my new ring perfectly. I am ready to wear it for any occasion. I gave this product to an elderly friend to keep her from losing her rings and it works great. Do not have to depend on a jeweller for sizing. One ring can be adjusted to fit several fingers. Rings that can not be sized I.e. electroform or plated, you can insert sizer. It stays in the ring and keeps ring in place. Love it. There are several strips with several sizes to customize any ring problem. You just measure, cut, let it form overnight. Then see if you need to cut any of the length. The longer the strip, the smaller the ring size. The shorter the strip, the larger the ring size. The strip stays inside the ring pretty well. However I used some silicone caulking. just a dab to make sure the sizer doesn't come loose. When my WEDDING RING fell off my finger. Follow directions and cut very carefully. It's better to cut slightly larger and cut down a little at a time than to cut sizer too short. After 44 years my wedding ring fell off my finger after I had lost weight and was gone for 2 weeks before I found it again, much to my relief. This item worked perfectly for me on my first try, and after 5 minutes, I didn't notice it at all on my finger. I wear it 24 hours a day. This product would also be useful for rings you might want to wear on various fingers or for rings acquired from others where you don't have much choice in size. I have difficulty wearing rings as the size of my fingers change due to swelling. These ring guards worked great and can also be used if you decide to wear a ring on a different finger. No worry on losing loose ring on finger. A practical and comfortable way to make sure that rings that are too loose on finger, will not be lost. I needed to make a band ring smaller and it worked perfectly. Came with various size strips. Great Help for Temp Weight-loss! This works great for me after having lost weight quickly due to sickness. Only one that I have found that works. I live in the Midwest. A ring was given to me by my husband for Christmas (yes he did good). It is a little big right now,but I hate to size it down. The Midwest is humid in the Summer,and I think the ring will fit perfectly then. These little guards go in and can be removed so easily.I am even using one on my wedding ring to keep it in place also. Great for anyone that has large knuckles, water retention or lives in humid environments. Fit perfectly for my fiances wedding band. I was searching for this product and even got tired of searching until I got an email from this store and here I found the product I was looking for. The ring adjusters worked great. Lost weight due to illness, and wedding band kept falling off. Your ring adjusters were just the right medicine. Now my ring fits nice and snug. Thanks for a great product. Tried a lot of products to keep rings from sliding this is the only one I have found that truely works. My only conplaint is that I can't get only the size I need. There is only one out of the entire bag that fits so the rest end up in the trash. I really don't like that!!!! Concept was awesome but was too think to make it work with my ring. No negatives about the product itself. Would have been perfect had it worked. Best Buy of 30 Years!!! You Must take your time, & Make Sure you have The Right Side Touching the ring!!!! The Smooth part touches You. The Grooved side with Edges Touches Ring. Warm up with hot water helps bend it before using. Put your Ring On First! Then Manuver the sizer between ring & your finger. These really are the Best sizers available!!!! I've gotten Many commplements on them. Won't use anything else!!! Having a broken knuckle made the wedding ring a pain to fit correctly. Thanks to the ring adjuster, I have a ring that has been sized fits over the knuckle but where it was loose before is now nice and snug where it I want it to sit on my finger. Thanks! FITS PERFECTLY AND IS INVISIBLE. NOW IT MAY BE DIFFICULT TO BEND. SOLUTION IS TO FIT IT INSIDE THE RING AND USE A SMALL CLOTHING STEAMER TO SOFTEN PLASTIC AND BEND IT TO SHAPE. I USE A TWEEZER OR PINCHED NOSE PLIER TO HOLD IT IN PLACE WHILE STEAMING. IT WILL BEND EASILY. KEEP IT INSIDE RING WHEN NOT IN USE TO RETAIN SHAPE. YOUR WELCOME!!! These are great. They can be cut to fit any ring size, so you don't loss your valuable rings. They don't even show. These ring adjusters work really well . These ring adjusters ate great there not buclky and keep ringbin place. I really like this product just wish it would stay put but I would tell a friend and buy it again. These ring adjusters are great. In warm weather ring fits well, in cold weather adjusters take up the slack and prevent ring from spinning on my finger. Just have to remember to put the smooth side toward your finger and ridge on top, otherwise adjuster will slip out easily. Worked GREAT for boyfriends Band..
Bought for boyfriends ring instead of sending the ring back to be resized and worked perfectly. I used these years ago and they are awesome! They fit without an ugly space at your hand - you can't even see them once they're inside your ring - and they are very comfortable. I have bought this item before. As I have aged it is hard to get rings over knuckles. I can just slip the in and my rings stay on. It was a perfect fit but to the next smaller finger, which turned out to be the ring finger anyway. I had been wearing on my pointer finger because of the size problem. This is the perfect answer. Requires dremel tool, cigarette lighter, and a nail clipper. Works well after modification. Initial product reduces size by 2 (ex: makes a 8.5 ring into a 6.5 ring). Use nail clipper to cut adjuster down to proper length. Lay adjuster inside ring. Hold ring horizontal 6 inches over cigarette lighter and let lighter heat the adjuster up until you can form it to the shape of the ring. Then take dremel tool (with sander bit) to shave the inside of the adjuster down to proper size. I had to have my ring made 1/4 size bigger to comfortably fit over my knuckle but then the ring was big at the base of my finger. I found these spacers to work great to hold my ring in place. I make sure when I place them that the raised edge is out and have not had a problem with the ring slipping out of spacer. (Smoother side against finger) I use one size up from the most narrow and it does not seem to have a problem shaping it to the curve that I need. The wider strips do seem to be harder to shape but I don't use them. I used this product on a ring with a concave inner circle so it stays put nicely. It made the ring too small when I lined the entire ring, but once I cut it down to fill about half the space it worked quite well. I do believe the key element is the concave inner part of the ring which allows the spacer to stay put. I bought this product to put in a ring that could not be re-sized. It makes my ring fit perfectly on my finger. Not exactly what I expected but does work pretty good. I had my wedding band resized to accommodate an arthritic knuckle but then, it slipped backwards because my finger size is still small. The band hides under the back part of my ring and holds it in position. When I want to take the ring off, I just slide it off first. Nothing will be perfect short of resizing your ring, but these stay in the ring without popping out. I cut my adjusters to fit just the part of the shank that fit into them. I was at a jeweler yesterday and he offered to clean my ring. When he came back he said it was the best adjuster he had seen and asked where I purchased it. Take your time and do not rush. It does work. It will take a few minutes to get it just right. I now feel my ring is secure and will not fly off my finger when it is wet. Happy with end result. I lost a lot of weight and none of my rings fit. I needed a way to size my rings inexpensively. This was a great way to do it. it works for now, ope to get ring sized later. KEEPS MY RING FROM SLIPPING. Please read my review on SiteJabber.comThank you. My husband's wedding ring has become too large. It has a design all around the band, sizing would destroy the look. These bands are a good alternative to sizing. It looks better than tape. Instructions weren't clear, but we figured it out. So far it is the best product we have found for the problem. If you don't want to size your ring this works great. It's not bulky like the tube ones you can buy. I can wear my rings again. 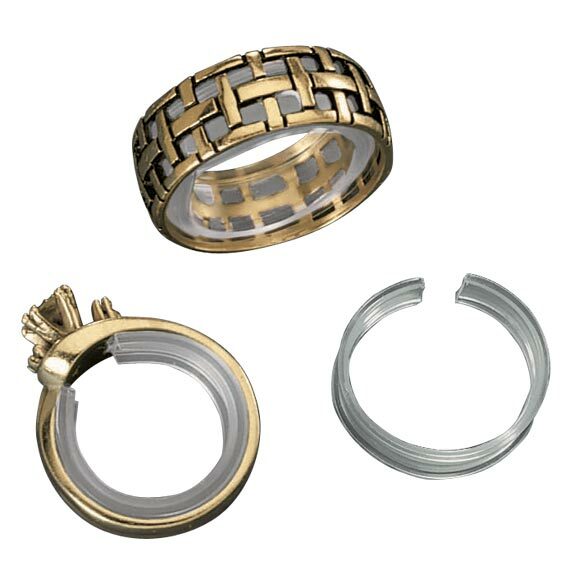 These ring adjusters are easy to use and allow me to wear certain rings again without having to go through the expense of having them adjusted by a jeweler. These are much more cost effective for me. I like the ring band adjusters because they are pretty comfortable and are easy to adjust to fit inside the ring to your finger. They are cheap and are easy to bend. Product does what it is supposed to and stays in place very well. I am not sure on if this is a good product. I bought them for my mom and she lives in another state. I hope this will work for her. For regular sized rings this product would probobly work well. But for my ring and size it proved uncomfortable and impractical, being that I have to take my ring off and put it back on for various reasons throughout the day. They work well once you get them into the ring. I like to wear my rings on all fingers and this product allows for those options. It's a great value. Cutting them for proper sizing can be a bit tricky but not impossible. I bought this for my Mom who has lost weight and her rings are loose. A jeweler charges a lot to size a ring. This is not easy for her or me to use. You have to install this on the ring after you put the ring on, then you need to remove it to adjust the size or remove the ring. Much easier to use if you have another person help you. Sort of works once you get it installed correctly. Since there are only a few of this type of product and it is very inexpensive, try it, it may work better for you. These adjusters did not fit the particular ring that we wanted to resize. They will be used for other rings. I couldn't get it to stay inside the ring. Very tricky to figure out how to use. Then difficult to do. I recently had surgery and I have not been able to try the product yet. I hope either of them work. Saved me a great deal of money by not having to have several rings resized by a jeweller. This product scratches your face when your washing it, be careful. The concept sounds good, but things just did not work for what was intended. First, the bands are too thick. I had purchased this produce for my husband who has lost a lot of weight due to illness. This was truly a waste of money. I read and followed the directions. But I couldn't get the adjuster to stay on the ring. I don't understand what keeps it in the ring band. Not happy with this product. I like that it is less obvious & conceals well. But much like the other reviews, there wasn't a strip which fit my ring despite the various sizes I received. There were no instructions on how exactly to use them. I selected the strip which fit the best & sized it as well as I could assume it needed to be sized considering the lack of instructions & it didn't stay on. It disappeared after a few hours of running errands. It also turns around inside the ring band while on my finger which is very annoying. Its a good idea all in all but actually using them isn't worth it. Purchased two sets for family at their request and needed just one. Sure that the second set was frustrating for the second family member and was probably thrown away. I actually used one of the ring guards...once figured out directions it actually works. The s & h was too expensive for such a lightweight product. Not good for long term use. I would use only for temporary fix. I am not sure if I will continue to use. This product works for the sizing but it is not very user friendly. I have had to have an extra set of hands to help. Would love to USE this product but don't know how to size the adjusters. This is the second time I've order ring adjusters, guess I'm just not too smart. I wanted to use it to hold my wedding ring in place. The may work for someone else but not for me. I bought it for a ring I bought for my girlfriend. She says it doesn't feel right and scratches her finger when she put the ring back on. We are going to seek professional advice and see what other options are available. This is a very good Idea. I had trouble keeping them inside my rings. They were stiff and difficult to keep in place. don't stay in place. Feel clumsey. Enables you to sixe rings. Would only use when necessary. These really seem like a good Idea. However, when cut to length to fit my wife's ring, it is still stiff and hard to get into place. Once there, it tends to come loose and slip out. So, it almost works but is not a really good solution. I use it on rings that roll on my finger, this is hard to get it on and get it just right, I don't have an answer for this problem, short of getting the ring fixed, which costs to much. We ordered this for my husband's wedding band. I thought with 5 sizes, one would fit but none of them were wide enough. Even if one had fit, it would have been hard to use. I thought it would stick but it doesn't and needs to be stuffed under the ring each time. Plastic needs to be more pliable. I prepared these ring adjusters according to instructions. They are hard to get into the rings if there is not a lot of space to fill, and pop out with the slightest movement. These ring guards are almost perfect- if they could be attached to the ring! The directions tell you to place the ring on your finger, then insert the plastic guard between the ring and your finger. They do not stay attached to the ring, and this must be done each time you wear the ring. I can only do this with help, and at times, the guard does slip out. It didn't work for me. These bands would be much better if they would fit narrower banded rings. I find also that they are a bit difficult to manage when you have arthritic fingers. I needed to ask one of my daughters for help with them. You get what you pay for, I guess. I thought these bands would really help my engagement ring from sliding in circles on my finger but I couldn't even get the ring on once the plastic was inside the ring. It made it SO unbelievably tight that there was no way to wear it. [...] got a different model and it works like a charm. DON'T WASTE YOUR TIME OR MONEY ON THIS GARBAGE PRODUCT!!! Wont buy again, they do not work. I well not order this again, they do not stay in the rings. It wasn't helpful at all. It fits to the ring, but comes out every time I move my finger. Again, the questions don't apply to this product! Get it together guys! I can't get them to stay on my rings. Tried wearing them on my loose rings and they fall right off. I purchased these as a gift to our son, so he could wear his wedding ring! the first two we tried broke upon trying to install it. The others we thru away!! BAD VALUE!!!!!!!!!!!!!! Difficult to fit properly. Maybe would work with a man's band but my rings are thin. these are the most difficult things to use i have ever ordered. DO NOT ORDER. This is a great idea to help with a ring that is just too loose. However, the plastic was hard to curve and would not stay shaped that way. It came in several sizes to fit most any width ring. It could be cut to fit which is a definate plus. I tried a long piece but it would not stay curved and kept popping out of my ring. So I tried a short piece but it didnt stay in my ring at all. Not a very feasible item! I never was able to use this product! I could not even get the ring back on my finger without the sizer popping back out! Just would not stay in. i couldn't figure out how to use item. there was no instructions with it either. This product is not something I would buy again.. very hard and difficult to wear. Its very uncomfortable inside the ring and didnt stay put. These did not stay inside the ring. Very good chance of loosing the ring that you put this in! Didnt fit at all terrible hard unvomfortable.to stiff wasted my money.tossed them in the garbage. the ring adjusters does not stay on the ring. Nothing great about this product, I want my money back, construction very very bad! The ring adjusters just wouldn't stay inside ring--not even after I glued it inside. Not Worth The Money Spent! The plastic is too hard and within 3 minutes it was coming out of the ring. There is no way to keep it in place. I think I will just use string. This was not what I expected. It would be cumbersome to have to insert this every time I wanted to wear the ring. I tried using them and just couldn't get them to work. Third party that it was being mailed to, never received it. ring band adjuster- not worth it.. The material is extremely hard and stiff and difficult to fit and use under most rings. They are way too thick to use. After I cut them to length and put them on I couldn't get my ring on at all. I thought they would be smaller and thinner. Not at all what I wanted. I was really dissapointed to realize that these don't work. They decrease your ring an entire size due to the thickness. Also, they slip out easily and you can loose your rings. Don't recommend. The adjuster did not stay in place. The product is inexpensive but useless. Don't waste your money !!!!!! Don't waste you money buying this product they do not stay on your ring and they are very hard they don't bind to fit you ring. Plus to send them back would cost more than the price you pay for them. DO WASTE YOUR MONEY!!! The different widths was very useful, but there was no way to hold them in place. These sizers do not work, they are useless junk. Threw in the garbage. Couldn't get the guards to stay on my ring and finger...slipped right off. These plastic bands are hard and uncomfortable and would not stay put inside my rings. Had to put it in each time I wore my ring. They did not fit inside the ring. Too rigid. Material s/b softer material and easier to mold around finger. Don't think I'll be using tese very often as they are hard and not as easy as description displays them to be. We found it impossible to use. Even after cutting to fit, did not work at all, kept slipping out of ring even with fit that was correct. Bulky and not workable at all and for skinner rings liked wedding (womens) would not work at all, threw all away, cheaper then retrn...recommendation, do not invest. This product was disappointing. For starters the inserts are difficult to use and need to be reapplied at each wearing of the ring. The so-called "ring adjusters" are very disappointing. I thought they were sturdy silicone like or soft plastic curved inserts that were malleable and truly adjustable. When I received them in the mail today from Walter Drake, I was highly displeased. They are simply thin strips of stiff, straight plastic with sharp ends. You can trim them all you want but they still are going to remain as stiff pieces of cheap plastic. I think bottle cap rings are stronger. You definitely cannot rely on them. They do not stay on securely and you will surely risk losing them. Moreover, they are uncomfortable to wear. Save yourself a few good bucks and do not buy this. So not buy this product. I would've returned it if it wasn't so cheap. I threw it in the garbage right away. It is very uncomfortable, when you cut it for adjustment it has sharp edges and need to make it smooth which i found very inconvenient. It is not a well made product at all. I won't buy this product again. Terrible over priced. To hard to install. Professional resizing can cost quite a lot, so many won't do it, especially for rings worn only occasionally. These plastic adjusters may work in a pinch. You cut the tubes of plastic to fit as much or as little as you need to make the ring tighter. The little plastic bands are uniform, so if you have a ring with a shallow band in back and a huge shank in front--like most class rings are designed--forget it. If your ring's band is rather uniformly the same size or you only need just a bit of extra at the back to keep the ring on your finger for that special night or whatever, these will look a lot better than tape wound round and round the back. Unfortunately, as soon as you take the ring off, these plastic bands will fall off. You can reuse them, if you can find them again, but they won't store easily in your ring case with the ring. If you need a more permanent fix, get the metal ones that you wrap the little metal pieces around either side to secure. The metal ones are a little more noticeable to others--and a lot more noticeable to the wearer (e.g. irritating)--they do stay with the ring even when removed from the finger. If the ring is really important to you and you want to wear it always, take it to a jeweler. It wasn't what I expected. The bands are too stiff and don't seem to work well. Can't use these; they are too stiff. Plastic is stiff and won't stay inside any of the rings I tried. Information on use with product. Was unable to use the ring sizer. I tried to do it the way the directions said, put the sizer around my finger then put my ring on. It would not work. I tried putting it inside my ring and then put it on my finger, it still would not work. they have to be put together and feel funny under ring. A round slip on would work much better! A flat back with the snap on is too hard to work with! A waste of money! Very disappointed, the ring adjuster jumped out of our rings all the time. Not worth it. This product was terrible and was returned to Water Drake. First time I have not been satisfied and I will still be ordering from them. My daughter needed to place it in her ring so it would not fall off her finger. It didn't stay in place inside the band, so ultimately, she was unable to use the product. Very disappointing. I thought this item would be more rubberized and attach to the ring in some way, but its just a thin hard piece of plastic that does not bend easily that you put inside the ring. I couldn't keep my ring on the plastic no matter which size I tried and it was uncomfortable to wear. Wasted money, cutting the edge off a milk carton would provide same result. These ring adjusters are very stiff and there are no instructions included with them. I was not sure if I should cut them or try to use the entire piece in my rings. Since the full length made the rings too tight I did cut them and then they would not stay on the rings. As soon as my finger slipped into the rings the adjusters fell out. Too thick, would not stay in the band. The liquid tube product would be better. It will better adhere to the ring and can be shaved to fit. This product was a waste of money. The smallest band was very difficult to work with. I could not get it around my finger once the ring was on. My husband tried the larger one for his Class ring as it was a little bit too big and he could not work with the plastic bands either. Wanted this to tighten up a "pinkie" ring with a narrow band. Well it won't work; too wide, falls out. If the plastic was thicker, it might stay in place by keeping the ring tighter to my finger. When I put the ring band adjusters inside the ring, it get too tight I can not wear my ring. The ring band adjuster is too thick. It took awhile to fit the ring adjuster and it was not easy to trim. Once I did get it fit properly, I tried wearing the ring and within minutes the ring adjuster popper right out without me even touching the ring. Didn't have it on long enough to find out if it is comfortable or not. I am worried about trying it again for fear of the ring adjuster falling out again and me losing my ring. I bought two sets of these. I opened one package and tried the slimmest one to fit on a band. Once you put your finger in the ring it slips off. Yes, there are various width sizes to fit different band widths; however, they all the same depth, making it impossible to size a ring. I would give it no stars, but for the review, the lowest you could give was one star. It did'nt stay on the ring. I FOUND THAT TRYING TO USE THE PRODUCT THAT THEY ARE HARD TO BEND, VERY SCRATCHEY TO YOUR FINGER, AND THEY SHOW EVEN AFTER YOU HAVE STRUGGLED TO CUT AND TRY TO AFFIX INTO YOUR RING. THIS IS ONLY MY PERSONAL OPINION. I THINK THIS PURCHASE WAS A WASTE OF MONEY. I found the bands very difficult to fit and once done, cut ends dug into flesh of finger. Tried filing edges down... didn't work. But for the price, it was worth a try. Not that much lost. Could not get it to fit inside my rings and fit on my finger. Very stiff and clumsy to use after you try to adjust to a good length. I bough this for myself. I have a ring I love but is a little bit loose. The item was very uncomfortable and hard to use. These are nothing but straight pieces of hard plastic. They are cheap junk. It costs more to return them so people just throw them in the trash. The company profits from the sale because no one wants to spend more money to return them! Plastic too thick and bands too large to work on ladies rings. They do not stay in place. A waste of money. I bought it to make my ring smaller. It did not work, wouldn't stay in and totally unsatisfactory. Went to the website to place my order specifically for this product. Followed the directions that were included with the product but the ring guard slipped out from underneath the ring after about two minutes of wear. Tried another size that came in the package but that did not stay either. Thought this would solve the problem of my ring slipping around but instead I just wasted time trying to get it to work. I was very disappointed with these. These were ridiculous. Even though they were only [$] they were strips of hard plastic that could not be bent to fit inside a ring. They all went in the garbage. This is the most ridiculous thing and should not be sold by Miles Kimball. Impossible to use. The picture showed the adjuster conformed to the ring band, they are too rigid and do not conform at all. This product did not deserve the one star I had to check. Hard to get in the ring. Won't stay in the ring. It fell out immediately and did not even fit the ring properly to prevent slippage. A waste of money. I bought this for my husband's wedding band because his ring does not fit. We bought a titanium ring that cannot be sized and this was our last hope. We had tried a metal sizer inside of the ring and the "snuggie" sizer that you can buy at [...]; none were functional or practical. This sizer did not look at all like the picture and when we finally cut and sized it correctly, it popped right out of the ring while he wore it. Not worth it. Bought these for my husband in hopes they'd work for his wedding band. I didn't expect them to be so rigid. Hard to bend when trying to fit in ring. One broke on me and then when I finally got one in my husband said no way. It hurt and wasn't comfortable. Glad I got these free with the by 3 get 1 free deal and didn't have to waste my money. Not good at all. Does not do what it is suppose to do. Would send it back but don't want to pay the postage. The ring adjustors were AWFUL, "cheap" strips of very hard plastic, not flexible as expected, very difficult to bend to adjust to the rings. Very disappointed in this product. Unable to get any of the sizes to fit finger much less in ring itself. This was a real waste of money. Would NEVER recommend. I found one that I thought would fit but didn't snap to the ring band so it was useless. I used the ring band after about a hour my ring was loose because the ring adjuster came off. the idea of this product is great if only it worked. If you manage to insert one of these into a ring it cuts into your finger so badly you have to remove it. I have tried to use this product on several rings and can't get them to work. The most useless item I have ever spent my money on and i would never recommend to a friend. Item won't bend or conform to my rings. No instructions inclueded on how to use so I don't know if I am trying to us correctly. Cheap, hard, couldn't get inside ring. They do not stay inside the ring. Very disappointing! I feel I wasted my money on these. They did not work and ended up in the garbage. These didn't work at all. Terrible, stiff can't bend to right shape, cuts into finger. Can't put on when ring is on. Throw in garbage no good at all hard plastic!! Five strips of plastic in a small plastic bag, shipped in a big box, no instructions not even pictures. I put a strip of plastic in a too big ring and tried to put it on my finger and it fell out. Not worth the money. Not easy to use and very uncomfortable if you can get it to fit into your ring. I threw it away. They only fit specific wideth bands and once on, they slip out easily. Harder to put in then they are worth. I couldn't even get these to bend well or to stay inside my rings. I wasted my money on these and threw them away. This band adjuster is not the product you need if your ring is only one size bigger or the band goes from thin at the bottom to thicker at the top. You cannot put the adjuster all the way around the ring in either one of these cases. It did not stay in place, was uncomfortable and I lost it within 2 hours of wearing it because it fell out. I am truly disappointed. It was Ring sizers and They don't work or stay in the ring .. It was made of plastic that they expect you to mold inside your ring while wearing it. Plastic was NOT easily bendable! I have inexpensive rings that can't be sized and can't order in half sizes. I ve a few big rings. I have several rings that are too large and these should solve my problem. Only adjusters I can find that I like. I have been looking for ring size adjusters. These are the best price I have found. I need to find something to adjust a couple of rings I have - do not want to cut them or adjust them otherwise. My wedding & engagement rings are too big, so I don't wear them because I don't want to lose them. You had the item I wanted. Will fulfill need to tighten loose rings. To allow me to wear rings that are too big. Have several rings too big, have tried other sizers but they did not work. My husband lost a lot of weight, this is a temp solution to his ring finger being thinner to fit his wedding ring. I lost a very expensive 50th anniversary ring. This may help because my fingers swell and shrink depending on the weather. I love my rings I have worn many, many years but I have lost 240 lbs. and the rings are too big. Having them resized is a HUGE expense. I am hoping these adjusters will solve this problem before I lose a ring. I believe it will work well with a band. I have a resident that needs them to be able to wear her wedding band and other rings. I have a large knuckle in relation to the rest of the finger due to breaking that finger/knuckle as a kid. Makes for fitting rings a pain. This will hopefully solve my dilemma. Cheers. I ordered a ring from a company that only deals in even sizes. I had to order a size that was too large. Because I was looking for something for my rings as they are to big for me now. Hoping these will work. Think shipping amount is a lot for these items only. Wanted to be able to wear rings that are loose w/out having to get them re-sized. Need a ring adjuster that I feel will be a great fit. how does it stay in and not fall out? BEST ANSWER: It has to be heated to shape it. I didn't bother.